I would like to ask you if you have any information about when Bhismadeva did this 5-day fasting (Bhisma Panchaka) and what benefits he had when he did that penance. Bhishma Pancaka, as well as many of the historical and philosophical themes of the Vedic / Vaishnava tradition, would require much more time. Here I will summarize, touching only the main topics. Before doing this I would like to make the devote aware of the fact that my Archive is a vast mine of information. Everything I say here is there too. If you had entered you would have found all this that I am going to tell you now. If you sign up and help me with a small annual donation (one dollar a month does not remove bread from anyone’s table, but who can give more is welcome) I will be able to conduct more research, buy and publish more books and more so that I can always respond with more detail. And now let’s go back to Bhishma Pancaka. Bhishma Pancaka means the last five (panca) days of Bhishmadeva’s life in this world. We learn from various scriptures, including the Srimad-Bhagavatam, that Pitamaha Bhishma remains in his bed of arrows that pierced his body, thrown mainly by Arjuna and Sikhandin. Then he awaits the end of the battle of Kuruksetra. Then Yudhisthira asks him to instruct him and Bhishmadeva speaks the Santi Parva, who is the seventh of the eighteen Parva of Maha-bharata and is made up of 339 sections and 14,732 sloka. We have an idea of ​​the number of Bhishmadeva’s instructions if we consider that the Bhagavad-gita is composed of 700 verses and the Srimad-Bhagavtam of 18,000. It is therefore a real encyclopedia on Varnasrama-dharma. If you want to understand what is Varnasrama-dharma you should study Santi Parva. 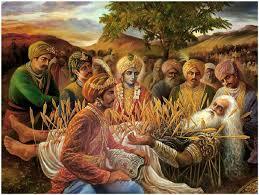 Pitamaha Bhishma fasted in the last 5 days of his life, which correspond to the last five days of the month of Kartika. The last day corresponds with Purnima, full moon. Those observing Kartika Vrata should intensify it during Bhishma Pancaka. The vow during these days give the same benefit of having observed all the other days of the year and free from any sin, even the most hateful ones and one gets all his material and spiritual desires. I mention only two verses. The Scriptures give very precise indications on how to observe Bhishma Pancaka Vrata, day by day.